21 | August | 2007 | ZOMG, Candy! 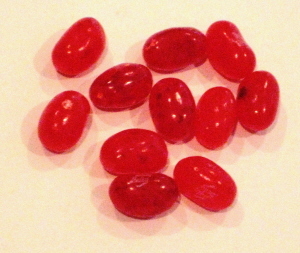 I have been searching for pomegranate Jelly Belly beans (BUY) ever since Cybele from Candy Blog reviewed them. I checked all the Jelly Belly selling places that I could think of, but to no avail. Finally, I discovered them in an unexpected place: the hospital gift shop. My doctor has an office at the hospital, and after my annual checkup, I decided to pop in the gift shop to see if they had candy. Not seeing any, I was on my way out when I noticed the Jelly Belly dispensers in the corner. Lo and behold, they had an entire dispenser just for the pomegranate beans! Hooray! The beans are beautifully colored, and my camera didn’t do them justice. They’re a gorgeous shade of red with white and/or dark red splotches. They taste good too. Honestly, I was a little disappointed at first taste because I had made these guys into my Holy Grail of candies. After a few more beans, however, I realized that my expectations were completely unreasonable. Just because the pomegranate beans didn’t send me to candy nirvana doesn’t mean that they’re not delicious. They’re a little tart and super fruity, with a little hint of olfactory raspberry. 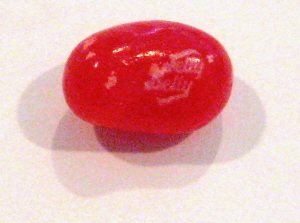 While I usually hate that taste, in the pomegranate Jelly Belly it was light, understated, and it worked. I didn’t get a distinctively pomegranate flavor, but then again, I haven’t had an actual fresh pomegranate in years, so I don’t really remember what they’re supposed to taste like. 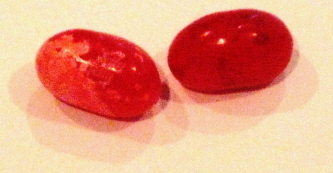 Either way, the pomegranate Jelly Belly is a tasty flavor that will mix well with the other fruit-flavored Jelly Belly beans that they already sell.